Sometimes getting round to it is the hardest part. Our sample personal development plans provides a structure that you can elaborate on as much as you like when you create a personal development plan for yourself. 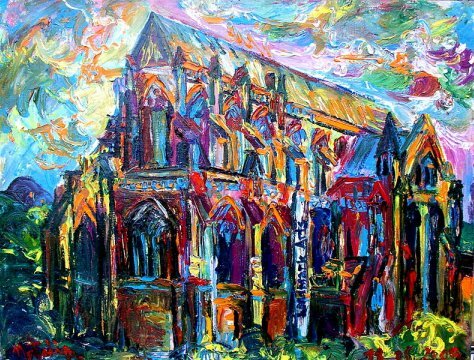 It is easy to see a comparison with sample personal development plans in the way a building like this fantastic, colorful and expressive cathedral is planned and built. (Artist: Natalia Chernogolova) You are your own cathedral. You have the power to plan it, build it and own it! It would be impossible to construct a building without detailed planning. Most importantly, the building is first constructed in the head of its creator. The building first exists on an abstract level. With that mental image, it is easy to lay out a plan, a blue print for how it is going to look in its material shape. Exactly the same thing is true of your own life. Your life needs a bit of planning too. It is easy to get stuck in irrelevant details, but with sample personal development plans, you will see a clear structure. And then it is up to you to add and subtract as much as you wish. The main thing is that your life follows your heart´s desire. If so, sample personal development plans like the one below, will be unnecessary. The concept of planning you life, and planning your own development puts many people off. We are all different, some of us are very detail oriented and enjoy getting everything down in writing. The writing process itself usually helps us to clarify and structure as we go along. Sample personal development plans will be very useful to create a personal starting point. The actual content will be decided by you. Other people are more free spirited and feel limited by writing down details. They fear that they will be restricted in life and spirit and often reject the idea of a plan, any plan... They fear that they have to follow the plan if they write it. And yes, there is power in words, especially written words, that is why contracts and legal documents are proof, something to refer to and agree upon. Similarly, if you create a personal development plan for your own life, there will be power in it, something to follow and stick with when you face obstacles. That is a positive factor, not something to procrastinate. So decide to take your life seriously enough to spend a little time evaluating what you want and how you will get it. For people in this category, our sample personal development plans provide doable instructions without being overwhelming. For those of you who need sample personal development plans, we will provide one for you. Just bear in mind that a plan is indeed personal and could be designed in countless different ways. But we believe that certain elements are required to make it into an effective plan. Consequently, focus on the key elements and then be as creative as you like! Please note that there are useful similarities between these sample personal development plans and goal setting. Therefore, also check out the goal setting section! Figure out what changes you want in your life. Write them down. It could be financial improvement, better health, more satisfying social life, higher grades, a nicer home, more time with your kids, less time at the office or just about anything that is important in your life. Many people want to get rid of a bad habit, like smoking. That naturally concerns health, but a change like this will probably indirectly lead to improvements in most other areas in life too. Therefore, the next step is to find out the reasons behind your "what". Always bear in mind that sample personal development plans serve as examples only. You create a personal development plan for you and not anybody else´s life. Accordingly, you have to figure out exactly WHY you want to implement this change/these changes in your life. And why is that so important? Well, if you know why you are doing something, it means you have a goal, a desired outcome. And it is so much easier to work towards a clearly specified goal than none at all. "How are you going to hit the target if you do not have one?" (Zig Ziglar) Now you begin to see the close parallels with successful personal goal setting. There are two main subcategories of the "how"-factor. a) Think about HOW this particular change will improve your life. With the quit smoking example, you would list benefits such as better personal economy, improved health, more beautiful looking skin, a fresher breath, mental strength through knowing that you could do it (and apply the same strategy to other areas too), longer life etc. b) This is the practical aspect; Exactly HOW are you going to achieve this? HOW will you make it happen? Hopefully it will be very easy. And ideally you should keep it simple. You want to quit smoking? The best thing to do is to stop putting cigarettes in your mouth! Well, most of us like to create a more viable plan than that, but the general idea is so true. Do not make things complicated. If you have figured out your "what" and "why", the rest is just the action. Of course, you need a lot of motivation, but that is what you get from your personal list of "WHY" you want the change. All factors interact. This aspect ties in with "how" to a great extent, because it deals with the time factor. Many of us feel that we lack time, and perhaps we do if we spend it unwisely. Time is an asset, and unlike money, it is equal in the sense that we all have the same amount to spend. We all have 24 hours in a day (and night). When we want to implement some changes in our lives, we often habitually claim that we have not got the time. Scrutinize the facts, and you will probably see that if you prioritize more wisely, you will find the time. Most people really do not need to spend 3-4 hours per day in front of the TV. Throw out the TV and you might end up with 20 hours per week to pursue your personal development plan. That is more than 1000 hours in a year! So what else can you expect to find in sample personal development plans? Make a time schedule to fit in your new activities and habits. Make sure to schedule the important new habits first. Prioritize those actions, so they will actually happen. If you do not schedule them, they will only happen when you "feel like it" and in most cases, that is never! So take your life seriously enough to fit in new and enhancing habits into your life´s puzzle. Hopefully our sample personal development plans will provide some assistance. If you have scheduled a particular action to improve you life, then do it! Often thinking about a task is more tiring than actually doing it. Perhaps you need some daily affirmations to keep your mind focused? Keep a journal where you write down ideas, thoughts, feelings or anything else that relates to you and your development. Do not make an unrealistic personal development plan for yourself. If you do, you will be de-motivated. Instead, go for little but doable changes. As you succeed with those little things, you will be motivated to achieve even greater things. The things outlined in this and other sample personal development plans are intended to inspire and guide you. But you and only you can implement the changes you need in your life. It is your choice! Learn more about sample personal development plans from our newsletter. We offer our readers a free subscription to "Free Inside Out" Newsletter. In it, we cover topics like sample personal development plans, goal setting, success, affirmations, inspiration and lots of other personal development tools and information. Leave Sample Personal Development Plans and Return to What is Personal Development?